Unlikely stars of stage and screen they may be, but tarantulas, vultures, elephants and cockroaches (and every dog) have their day in showbiz! Animals have personalities. No amount of computer generated clever animatronics caninteract with a cast of actors in quiet the same way. In situations where the animal actor is a family pet, convincing emotions are a crucial part of the storyline, there needs to be a relationship between the animal and the rest of the cast. Trainers who work in this field have extensive experience in both animal care and psychology. They build up lists of contacts and have numerous animal owners on their booksso that, if they do not have an animal themselves that is suitable for a particular project, they know who has. It is their responsibility to have the required licences, insurances, movement orders and details of Animal Consultants and Trainers Association (ACTA) vets. These trainers also offer risk assessments for each project and pre-production advice. The welfare of the animals and safety of the situation are always top priorities for trainers. Which Animals are Best Suited? As part of the pre-production advice, some trainers recommend using specialist photographers/camera crews to get the best results. Long before an animal is anywhere near the production set, the trainer will have had a copy of the script to assess the part, discussalternatives or improvements and plan their choreography of contact points or movements for the training schedule. Where appropriate, animals will be familiarised with the stage set by having a replica at home to train on. They will also get to know the actors involved in the scenes they are in. Before filming or photographic shoots start, rehearsals will be carried out with all the actors on set, as normal. 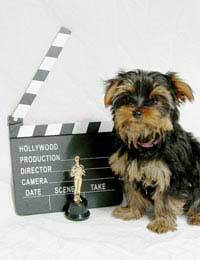 Professional trainers accompany their actor animals to make sure the animal is settled and confident and all is as it should be, that they are comfortable with what is asked of them in studio conditions. Animal doubles are used in some cases. In period dramas there is a particular demand for horses. Again, the animals are not doing anything out of the ordinary in terms of behaviour, they are simply trained to ‘actnatural’ in unnatural surroundings. Trainers who specialise in equine actors usually supply the props relevant to the period. If a jousting horse is needed, they will have the horses and all the equipment, because the horses have been trained with that equipment it is normal for them. Similarly, specific types of driving carriages can be supplied, they are all familiar objects. Even authentic antique leech bowls can be found, not because the leeches care, but for historical accuracy! When dealing with large numbers of potentially dangerous animals, teams of animal trainers are necessarily involved. Shots of a pit of writhing snakes may be filmed separately and not always on set. Close-ups of tarantulas crawling over a person may also be taken elsewhere but more often it is the human actor who needs extra rehearsals! The spider is more concerned about reaching its reward. When several different species of animal are used in a set, they will have ‘worked’ together for a sufficient amount of time and probably all come from the same trainer. Orphaned animals of mixed species are sometimes reared together by trainers to establish the pack/herd bonds that facilitate them working as a group later on. The lives of animal actors may take them to unusual places and involve meeting the stars, but for them, it’s all in a day's work.